Aircraft condensation trails - known as contrails - can dissipate, becoming indistinguishable from other clouds. If trends in cheap air travel continue, says Professor Gerry Gilmore, the era of ground astronomy may come to an end much earlier than most had predicted. Aircraft along with climate change will contribute to increased cloud cover. The timescale is based on extrapolating air traffic growth figures. The BBC has learned that the calculations were made as part of preparations for an upcoming observatory project called the Extremely Large Telescope (ELT). 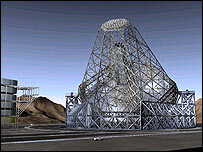 The ELT is intended to probe planets around nearby stars and look for extremely faint objects in the Universe. "It is already clear that the lifetime of large ground-based telescopes is finite and is set by global warming," Professor Gilmore, from Cambridge's Institute of Astronomy, told reporters recently in London. "There are two factors. Climate change is increasing the amount of cloud cover globally. The second factor is cheap air travel. "You get these contrails from the jets. The rate at which they're expanding in terms of their fractional cover of the stratosphere is so large that if predictions are right, in 40 years it won't be worth having telescopes on Earth anymore - it's that soon. "You either give up your cheap trips to Majorca, or you give up astronomy. You can't do both." Climate change is also expected to increase the amount of water vapour in the atmosphere through evaporation, contributing to overall cloudiness. The increase in cloud cover would affect both optical and infrared astronomy, which would have to be carried out from space. Radio astronomy would continue to be ground-based. Contrails often present little more than a transient nuisance to astronomers; but when certain weather conditions prevail, they can break to look like natural clouds. Holger Pederson, an astronomer at the Nils Bohr Institute in Copenhagen, Denmark, who has studied contrails, explained: "You can recognise the jet contrails when they are young. So you can stop your observation and then restart as soon as the contrail has passed the field of view of the telescope. "Worse is when the contrails last for hours. Then they degrade into something you can hardly distinguish from natural cirrus clouds." Dr Hermann Mannstein, of the German Aerospace Centre (DLR), agreed astronomy would become more difficult, but said there was an upper limit on the contrail problem. "You don't clog the whole sky. You have a certain proportion of the sky, in time and space, that can be affected," he said. But Professor Gilmore countered: "There are places where you get relatively fewer clouds - that's where we put our telescopes - but there is nowhere on Earth that you don't get clouds and aeroplanes. "Already, around the major observatories, there are local laws to prevent aeroplanes flying within quite large distances," he told the BBC News website. Professor Gilmore said sites where observatories are located, such as the Canary Islands, Hawaii and South America, are also attractive holiday destinations, and likely centres for future air traffic growth. He added that the projections did not factor in the effects of global warming, which are likely to exacerbate the problem. Mr Pederson said too few satellites built up image data on how contrails evolved over time. "We may underestimate the amount of contrail-derived cirrus clouds," he said. "We know from satellite imagery that clusters of contrails can last for two days. If carried by the upper jet stream through the troposphere, they can travel hundreds of kilometres." There are several concepts under consideration for the European ELT, but the preferred design seems to be converging on a telescope that is some 30-60m in diameter. A location has not been decided; but, despite the difficulties of access, Antarctica may become an option. The icy region has relatively clear skies, with a climate that is somewhat separate from other continents, and, crucially, is free from overflying commercial jets.